Robart Electrical Services Ltd. Can You Sell A House With 60 amp Service? | Robart Electrical Services Ltd. If you’re planning on selling your older home (built prior to 1965), check to see if you still have an original 60-amp electrical service. Most insurance companies today, are not giving buyers of older homes insurance until the service has been upgraded. If the house is uninsurable, the mortgage broker cannot give you a mortgage. Many people over the years have thought that since the sticker on the electrical panel says 120/240 volt 100 amp, that that was the rating of the service, that’s incorrect. That sticker is the manufacturers rating of the piece of equipment only. Realtors working for buyers today are asking for up to $10,000 off the selling price if you still have a 60-amp service. The cost of a residential 60-amp service upgrade usually costs less than $3,000.00. 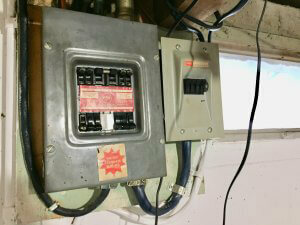 If you want to pre determine if you have an original 60-amp service, call us at (780) 238-8195 and we will help you.